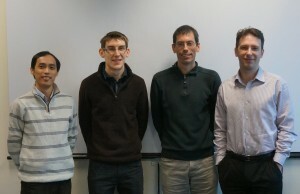 Today, Ian Doidge successfully defended his PhD thesis: Utilising Path-Vertex Data to Improve Monte Carlo Global Illumination. Well done Ian. Mark W. Jones was the supervisor, Markus Roggenbach the viva chair, Gary Tam the internal examiner and Kurt Debattista (Warwick) the external. Ian’s contributions were published as Probabilistic illumination-aware filtering for Monte Carlo rendering and Mixing Monte Carlo and Progressive Rendering for Improved Global Illumination. This entry was posted in PhD Viva and tagged Computer Graphics on November 27, 2013 by Mark.